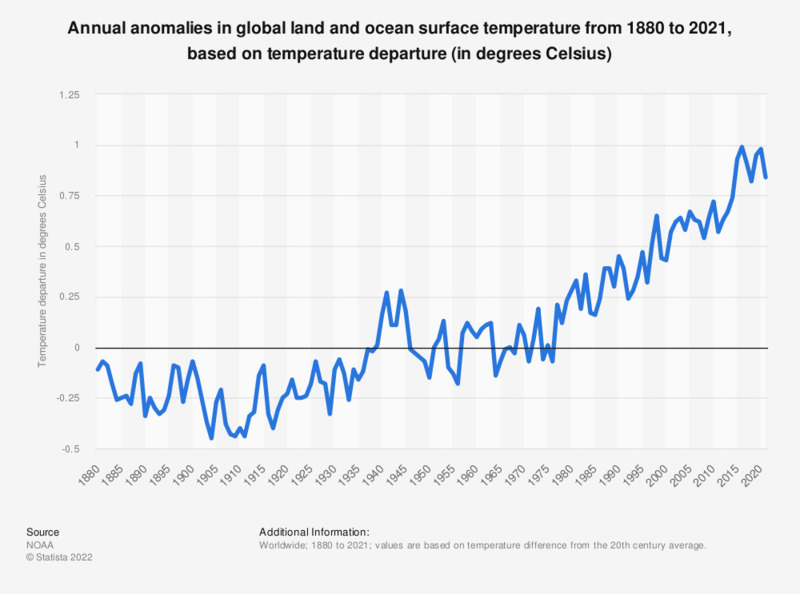 This statistic represents annual anomalies in global land and ocean surface temperature from 1880 to 2017, based on temperature departure from the 20th century average. In 2017, land and ocean surface temperature was around 0.84 degrees Celsius warmer than the average. * Data are based on temperature departure from the 20th century average. To access data, select Parameter: Average Temperature; Time Scale: Annual. How many of the last 18 years have been the hottest for the world as a whole since the World Meteorological Organization began collecting data in 1961? As far as you know, do you think the world's climate is changing or not? Which one of these possible effects of global climate change concerns you most? United States: How strongly do you agree or disagree with the following statements on the current weather?